HAPPY BIRTHDAY EV!!! Around this time 5 years ago we had just met-having just gone on a few dates. 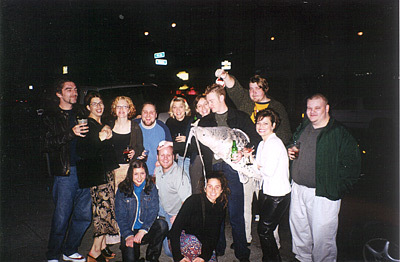 Everyone got together for a crazy night of celebrating your birthday and after visits to many pubs with a huge stuffed catfish we found ourselves in a bar brawl. While laying on my back on the sidewalk my hair in both fists of a girl kneeling over of me all I could think was how much I wanted to always be near you and hoped that this would not change your opinion of me. But it did…only making it clearer that I was the gurl for you! So here we are 5 birthdays later far from the bar brawls and pub crawls but I still want to always be near you and love you more then this life time will allow me to show. Happy Birthday Ev!